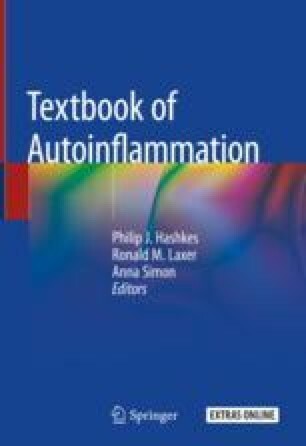 Autoinflammatory diseases represent an expanding spectrum of diseases characterized by recurrent episodes of fever and systemic inflammation, due to disorders of innate immunity. Since the concept of autoinflammation was first affirmed in 1999 to define TNF-receptor associated periodic syndrome (TRAPS), many other monogenic autoinflammatory diseases have been identified. Uncontrolled secretion of IL-1β is responsible for the many of these syndromes, as also confirmed by the dramatic clinical response to IL-1 blockade. More recently, different mechanisms have been implicated in the pathophysiology of several monogenic autoinflammatory diseases, including cell stress, dysregulation in NF-κB signaling, ubiquitination, protein folding, type I interferon production and complement activation. In this chapter, we discuss IL-1β and other members of the IL-1 family and their inhibitors involved in monogenic autoinflammatory diseases, focusing on the mechanisms underlying their secretion in health and disease. Furthermore, we describe type I interferons and their role in autoinflammation.